Attempts to create great a signature pair of training boxing gloves by Ring to Cage C-17 has finally paid off. They have successfully created one of the most efficient boxing gloves, resulting in their high demand in the market. The gloves are mostly referred to as the Japanese Style gloves and are becoming increasingly popular. In most cases, people usually take less consideration for the gloves the train with. They do this with the ignorance of not knowing the vital part the gloves have to play in their training and competitive boxing. One must understand that the type of gloves used in practice and fighting plays a crucial role in the success of both boxing workouts and competitive sport. In this case, we shall take a look at one of the best training boxing gloves on the market today. We shall see what makes them exceptional and the essential features of the Japanese-Style Training Boxing C-17 2.0 Gloves. The gloves are made up of greatly layered padding; this is the kind of feeling that makes them feel broken right out of their box. They are sure to provide you with maximum protection, so one can just decide to go sparring right away just after the acquisition. Although when it comes to the wrist support is not that good compared to another Velcro version of gloves on the market, they still don’t hurt the wrist when using them. One will only feel some shocks when throwing punches using these gloves. So one can choose to add wrist pads just to support them and feel comfortable with them. It doesn’t have any impact when it comes to the protection of your wrists; you won’t get injured while using them. However good the padding can be, with the 16oz gloves one can manage to punch through it. In every hook you send to the heavy punching bags, you will be able to feel the connection of the knuckles. Also with these straight hard hooks, you won’t hurt your hand in comparison to the use of 14oz on the same bags. The soft paddings made in the Ring to Cage C-17 boxing gloves are the reason for this protection. This kind of effect can only be noticed when training, by punching heavy bags, and not by mere sparring. The Ring to Cage C-17 performs very well no matter what you are going to put them through. These gloves are multipurpose in the boxing game, from training with bags to sparring. One can decide to use the 16oz for punching bags and experience the comfort, and still use them for sparring. The great thing about using these C-17 gloves is that they will protect both you and your sparring partner too. Most of the sparring partners prefer being hit by the 16oz C-17 training boxing gloves, compared to other 16oz gloves. The other under quality gloves could make you feel the brain hurt when you get hit, they have less comfort and can get you hurt. The difference is that instead of feeling that jarring feeling when you get caught with 16oz C-17, you will have a stinging sensation. Getting hit usually hurts, but at least with these gloves, you will have a much better feeling compared to other boxing gloves out there. 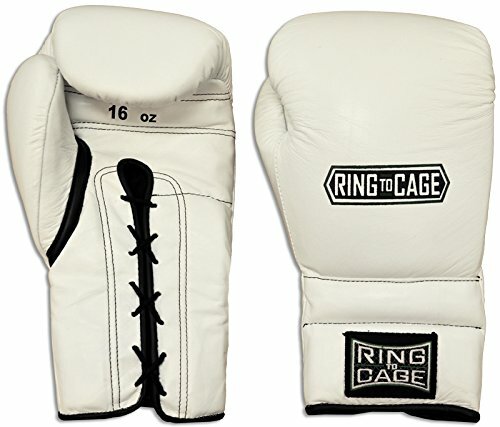 This Ring to Cage C-17 provides protection for your hands and your sparring partner, hence making the training more fun. These gloves are impeccable; this is due to the materials used and the padding as well. The liner used is very soft, this enables it to provide a comfortable feeling as well as fantastic sweat management. The only issue with the C-17 comfort is the rough tag used, but everything else is just perfect. Most people usually get rid of the card, just to feel the whole softness and comfort that comes with the gloves. Another great job that the padding used does is molding your hands, you will never experience discomfort when using the Ring to Cage C-17 training boxing gloves. The designed hand compartment is more full, meaning one can use more hand wraps to increase the support. It doesn’t matter the kind of hand wraps used; the gloves will still feel great. Another great feature about the C-17 gloves is that it uses a straight thumb which will enable you to make an ideal fist. This thumb used is better compared to the other boxing gloves in the market. Although the 12oz thumb is slightly short compared to the 16oz, the padding usually ends before the actual ending of the thumb. You will feel where the filling ends at the roof of the thumb, this does not cause any issue but just feels a little weird. All in all the C-17 boxing gloves provides excellent comfort to the user. There are very few gloves in the market today that can offer this kind of support. It is one of the vital reason boxers opt to use the 16oz Ring to Cage C-17 gloves. One will experience great comfort as well as; one will be assured of the support. The quality of C-17 training boxing gloves doesn’t match a lot of the boxing gloves in the market. Compared to the others with this superior quality, the gloves come at a grand bargain. C-17 training boxing gloves are probably the best quality gear Ring to Cage offers. The liner along with other materials used is of superior quality. The horse leather used for these gloves is not compared to any other boxing gloves of this standard in the market. They are sure to last long no matter what you put them through during your training. Although the leather may seem kind of ugly, the work it does is immeasurable. Not likely to those gloves that look attractive but have poor quality and don’t last long enough to feed the cost of their acquisition. A leather conditioner is used to make them look better but, what is important here is the durability factor of these gloves. Although sometimes there may be issues on the stitching of the logo, these are minor issues and has nothing to do with the performance. The leather is usually adequately stitched to ensure that they don’t get ripped off during the training sessions. The stitching of the overall C-17 is usually neat and clean, especially with the black gloves which have a much better look. The piping ends sometimes look terrible, but the good thing is that the leather doesn’t get scratched off. In other times one can find the thumbs kind of flattened, but that is just because of the packaging, it not a big deal. They are still as comfortable as they are supposed to be. The C-17’s 12oz, 14oz, 16oz and 18oz all have their actual weight. For instance, the 16oz the gloves usually weight 16,2oz for the left hand and 16.1oz for the right one. As for the 12oz the gloves usually weight 12.1oz for the left side and 12.3oz for the right hand, the same applies to the 14oz and the 18oz. The variants are all evenly distributed to ensure that they don’t bend at the wrist. They sometimes feel a bit heavy, but this is just minor, it’s not extreme. The best thing that the user of these gloves will undoubtedly enjoy is the durability quality. Even if used for an extended period with extensive and intensive training, the C-17 gloves will still look as good as new. This is the real worth of the money paid in acquiring them; they won't disappoint you with this. One will become addicted to obtaining the C-17 boxing gloves series. The best way one can describe these gloves is calling them “winning gloves.” This is due to the excellent work that Ring to Cage has done so far in producing great products. The modifications added to this new edition they have produced extremely inspiring. From the 12oz gloves to the 14oz then 16oz up to 18oz, are all well designed with exceptional comfort and style. The high style is unique, that's why they identified themselves as the Japanese Style. The flat profile offers an excellent hand compartment, which is great for the users. With this profile and in addition to the softness with a straight thumb, it enables you to create an ideal fist. It doesn’t matter with the size of your hands; with C-17 boxing gloves, you will be able to make a whole fist, unlike other gloves. Along with all the qualities that these gloves possess, their prices are still very affordable in the market. The prices range varies from store to store, but overall, they are very affordable in comparison to other brands with lesser qualities to this one. 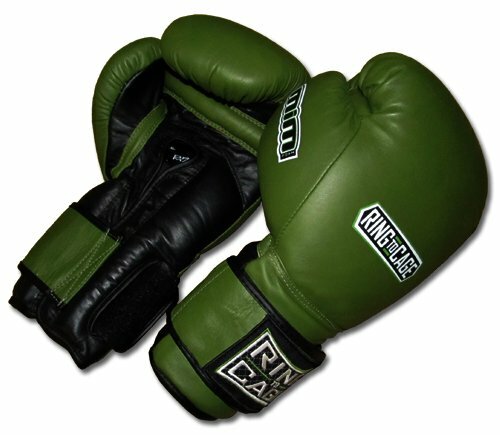 You can just visit some sites online where the Ring to Cage boxing gloves is available. In the store, you will get more information about these training boxing gloves, as well as how to order one for yourself. Just try them and experience these great qualities for yourself.